Roger N. Anderson, Boyi Xie, Leon Wu, Arthur A. Kressner, Joseph H. Frantz Jr., Matthew A. Ockree, and Kenneth G. Brown. Petroleum Analytics Learning Machine to Forecast Production in the Wet Gas Marcellus Shale. In Unconventional Resources Technology Conference (URTeC 2016), August 2016. Roger N. Anderson, Boyi Xie, Leon Wu, Arthur A. Kressner, Joseph H. Frantz Jr., Matthew A. Ockree, Kenneth G. Brown, Peter Carragher, and Mark A. McLane. Using Machine Learning to Identify the Highest Wet Gas Producing Mix of Hydraulic Fracture Classes and Technology Improvements in the Marcellus Shale. In Unconventional Resources Technology Conference (URTeC 2016), August 2016. Roger N. Anderson, Boyi Xie, Leon L. Wu, and Arthur Kressner. Petroleum Analytics Learning Machine System with Machine Learning Analytics Applications for Upstream and Midstream Oil and Gas Industry. U.S. Patent Application No. 15/409,425, Priority Date: June 15, 2016. Hugo P. Simão, Hyun Bin Jeong, Boris Defourny, Warren B. Powell, Albert Boulanger, Ashish Gagneja, Leon Wu, and Roger N. Anderson. A Robust Solution to the Load Curtailment Problem. In IEEE Transactions on Smart Grid, September 2013. Cynthia Rudin, David Waltz, Roger N. Anderson, Albert Boulanger, Ansaf Salleb-Aouissi, Maggie Chow, Haimonti Dutta, Philip N. Gross, Bert Huang, Steve Ierome, Delfina F. Isaac, Arthur Kressner, Rebecca J. Passonneau, Axinia Radeva, and Leon Wu. 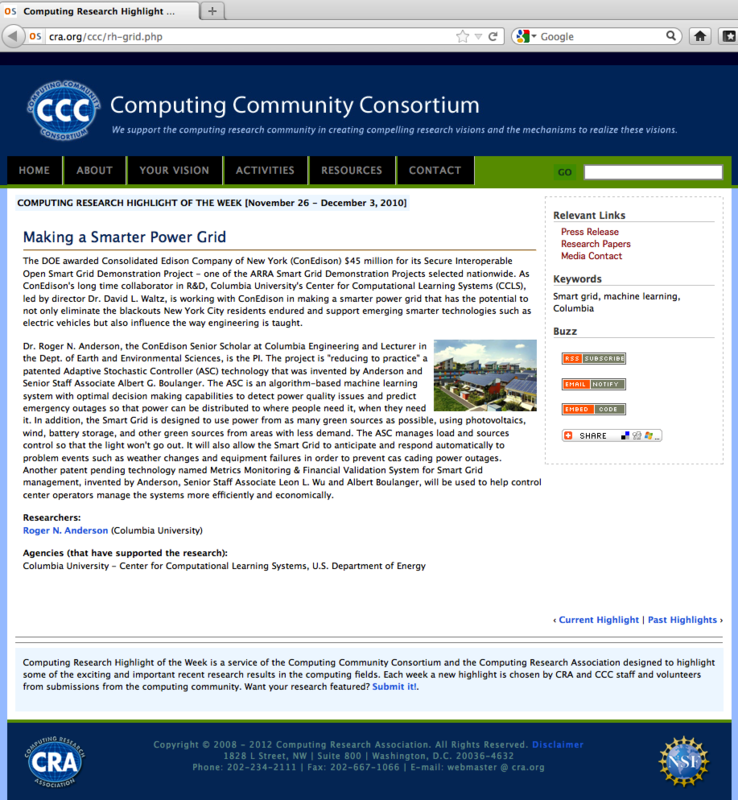 Machine Learning for the New York City Power Grid. 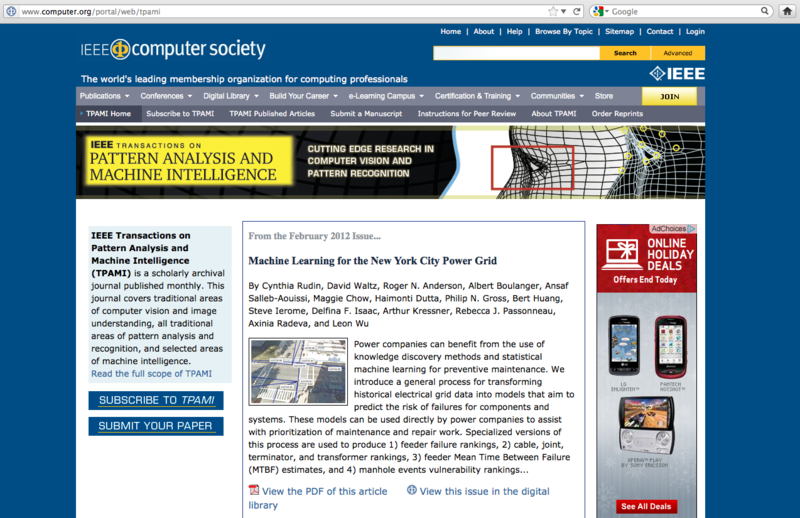 In IEEE Transactions on Pattern Analysis and Machine Intelligence, May 2011. Leon Wu, Timothy Teräväinen, Gail Kaiser, Roger Anderson, Albert Boulanger, and Cynthia Rudin. Estimation of System Reliability Using a Semiparametric Model. In Proceedings of the IEEE EnergyTech 2011 (EnergyTech), May 2011. Leon Wu, Gail Kaiser, Cynthia Rudin, and Roger Anderson. Data Quality Assurance and Performance Measurement of Data Mining for Preventive Maintenance of Power Grid. In Proceedings of the ACM SIGKDD 2011 Workshop on Data Mining for Service and Maintenance, August 2011. Leon Wu, Gail Kaiser, Cynthia Rudin, David Waltz, Roger Anderson, Albert Boulanger, Ansaf Salleb-Aouissi, Haimonti Dutta, and Manoj Pooleery. Evaluating Machine Learning for Improving Power Grid Reliability. In ICML 2011 Workshop on Machine Learning for Global Challenges, July 2011. Timothy Teravainen, Leon L. Wu, Roger N. Anderson, and Albert Boulanger. Metrics and Semiparametric Model Estimating Failure Rate and Mean Time Between Failures. U.S. Patent Application No. 14/047,879, Priority Date: April 14, 2011. Roger N. Anderson, Albert Boulanger, Cynthia Rudin, David Waltz, Ansaf Salleb-Aouissi, Maggie Chow, Haimonti Dutta, Phil Gross, Bert Huang, Steve Ierome, Delfina Isaac, Arthur Kressner, Rebecca J. Passonneau, Axinia Radeva, Leon L. Wu, Peter Hofmann, and Frank Dougherty. Machine Learning for Power Grid. U.S. Patent No. 8,751,421, June 10, 2014. Roger N. Anderson, Albert Boulanger, Leon L. Wu, and Serena Lee. Metrics Monitoring and Financial Validation System (M2FVS) for Tracking Performance of Capital, Operations, and Maintenance Investments to an Infrastructure. U.S. Patent No. 8,725,665, May 13, 2014. Leon Wu, Roger Anderson, Albert Boulanger, Cynthia Rudin, and Gail Kaiser. Failure Analysis of the New York City Power Grid. Tech Report CUCS-025-12, Department of Computer Science, Columbia University, January 2012. Roger Anderson, Albert Boulanger, Vaibhav Bhandari, Jessica Forde, Ashish Gagneja, Arthur Kressner, Ashwath Rajan, Vivek Rathod, Doug Riecken, David Solomon, Leon Wu, John Gilbert, Eugene Boniberger, Mattia Cavanna, Willem Neiuwkerk, Bruce Sher, and Nate Maloney. Di-BOSS: Research, Development & Deployment of the World's First Digital Building Operating System. In Automated Diagnostics and Analytics for Buildings, ISBN-10: 1498706118, ISBN-13: 978-1498706117, Fairmont Press, September 2014. Leon Wu, Gail Kaiser, David Solomon, Rebecca Winter, Albert Boulanger, and Roger Anderson. Improving Efficiency and Reliability of Building Systems Using Machine Learning and Automated Online Evaluation. In Proceedings of the 8th Annual IEEE Long Island Systems, Applications and Technology Conference (LISAT), May 2012. Roger N. Anderson, Albert Boulanger, Vaibhav Bhandari, Eugene Boniberger, Ashish Gagneja, John Gilbert, Arthur Kressner, Ashwath Rajan, David Solomon, Jessica Forde, Leon L. Wu, Vivek Rathod, Kevin Morenski, and Hooshmand Shokri. Total Property Optimization System for Energy Efficiency and Smart Buildings. U.S. Patent Application No. US 14/341,718, Priority Date: July 26, 2013. Leon L. Wu, Albert Boulanger, Roger N. Anderson, Eugene M. Boniberger, Arthur A. Kressner, and John J. Gilbert. Adaptive Stochastic Controller for Energy Efficiency and Smart Buildings. U.S. Patent Application No. US 14/203,151, Priority Date: September 20, 2011. David Solomon, Rebecca Winter, Albert Boulanger, Roger Anderson, and Leon Wu. Forecasting Energy Demand in Large Commercial Buildings Using Support Vector Machine Regression. Tech Report CUCS-040-11, Department of Computer Science, Columbia University, September 2011. Roger Anderson, Albert Boulanger, Promiti Dutta, Ashish Gagneja, Hooshmand Shokri Razaghi, and Leon Wu. Adaptive Stochastic Controller for Smart Buildings. In New York Academy of Sciences Ninth Annual Machine Learning Symposium, March 2015. Jessica Forde, Vivek Rathod, Hooshmand Shookri, Vaibhav Bandari, Ashwath Rajan, John Min, Ariel Fan, Leon Wu, Ashish Gagneja, Doug Riecken, David Solomon, Albert Boulanger, and Roger Anderson. Di-BOSS™: Digital Building Operating System Solution. In 2013 Conference on Neural Information Processing Systems (NIPS), December 2013. David Solomon, Albert Boulanger, Leon Wu, and Roger Anderson. Refinement of a Support Vector Machine Regression Model for Forecasting Commercial Building Energy Loads: A Use-Phase Approach to Building Energy Efficiency. In New York Academy of Sciences Seventh Annual Machine Learning Symposium, October 2012. Rebecca Winter, Albert Boulanger, Roger Anderson, and Leon Wu. Using Support Vector Machine to Forecast Energy Usage of a Manhattan Skyscraper. In American Geophysical Union (AGU) Fall Meeting Abstracts, December 2011. Rebecca Winter, David Solomon, Albert Boulanger, Leon Wu, and Roger Anderson. Using Support Vector Machine to Forecast Energy Usage of a Manhattan Skyscraper. In New York Academy of Sciences Sixth Annual Machine Learning Symposium, October 2011. Promiti Dutta, Albert Boulanger, Roger Anderson, and Leon Wu. An Innovative Approach to Vehicle Electrification for Smart Cities. In Handbook of Research on Social, Economic, and Environmental Sustainability in the Development of Smart Cities, ISBN-10: 1466682825, ISBN-13: 978-1466682825, Series: Advances in Environmental Engineering and Green Technologies, IGI Global, April 2015. Jigar Shah, Matthew Nielsen, Andrew Reid, Conner Shane, Kirk Mathews, David Doerge, Richard Piel, Roger Anderson, Albert Boulanger, Leon Wu, Vaibhav Bhandari, Ashish Gagneja, Arthur Kressner, Xiaohu Li, and Somnath Sarkar. Cost-Optimal, Robust Charging of Electrically-fueled Commercial Vehicle Fleets via Machine Learning. In Proceedings of the 8th Annual IEEE International Systems Conference (SysCon 2014), March 2014. Roger N. Anderson, Albert Boulanger, Leon L. Wu, Vaibhav Bhandari, Somnath Sarkar, and Ashish Gagneja. Forecasting System Using Machine Learning and Ensemble Methods. U.S. Patent Application No. US 14/707,809, Priority Date: November 9, 2012. Somnath Sarkar, Vaibhav Bhandari, Albert Boulanger, Ashish Gagneja, David Solomon, Leon Wu, Arthur Kressner, Roger Anderson, Keshav Sondhi, and Matthew Nielsen. Using Support Vector Regression to Forecast and Optimize Energy Usage of a New York Package Shipping Depot. In New York Academy of Sciences Seventh Annual Machine Learning Symposium, October 2012. Boyi Xie, Rebecca J. Passonneau, Leon Wu, and Germán G. Creamer. Semantic Frames to Predict Stock Price Movement. In Proceedings of the 51st Annual Meeting of the Association for Computational Linguistics (ACL), August 2013. Leon Wu, Jian Pan, Jiahua Ni, Yu Song, and Yang Sha. Uniform General Algorithmic (UNIGA) Financial Trading Language. Department of Computer Science, Columbia University, May 2007. Leon Wu and Gail Kaiser. FARE: A Framework for Benchmarking Reliability of Cyber-Physical Systems. In Proceedings of the 9th Annual IEEE Long Island Systems, Applications and Technology Conference (LISAT), May 2013. Leon Wu and Gail Kaiser. An Autonomic Reliability Improvement System for Cyber-Physical Systems. In Proceedings of the IEEE 14th International Symposium on High-Assurance Systems Engineering (HASE), October 2012. Roger N. Anderson, Albert Boulanger, Leon L. Wu, Kevin McInerney, Timothy Teravainen, and Bibhas Chakraborty. Adaptive Stochastic Controller for Dynamic Treatment of Cyber-Physical Systems. U.S. Patent Application No. US 14/177,020, Priority Date: August 11, 2011. Leon Wu. Improving System Reliability for Cyber-Physical Systems. Department of Computer Science, Columbia University. Leon Wu, Boyi Xie, Gail Kaiser, and Rebecca Passonneau. BugMiner: Software Reliability Analysis Via Data Mining of Bug Reports. In Proceedings of the 23th International Conference on Software Engineering and Knowledge Engineering (SEKE), July 2011. Leon Wu and Gail Kaiser. Constructing Subtle Concurrency Bugs Using Synchronization-Centric Second-Order Mutation Operators. In Proceedings of the 23th International Conference on Software Engineering and Knowledge Engineering (SEKE), July 2011. Christian Murphy, Gail Kaiser, Lifeng Hu, and Leon Wu. Properties of Machine Learning Applications for Use in Metamorphic Testing. In Proceedings of the 20th International Conference on Software Engineering and Knowledge Engineering (SEKE), July 2008. Leon Wu and Gail Kaiser. Empirical Study of Concurrency Mutation Operators for Java. Tech Report CUCS-041-10, Department of Computer Science, Columbia University, April 2010. Nageswar Keetha, Leon Wu, Gail Kaiser, and Junfeng Yang. A Software Checking Framework Using Distributed Model Checking and Checkpoint/Resume of Virtualized PrOcess Domains. Tech Report CUCS-032-09, Department of Computer Science, Columbia University, June 2009. Nageswar Keetha, Leon Wu, Gail Kaiser, and Junfeng Yang. Distributed eXplode: A High-Performance Model Checking Engine to Scale Up State-Space Coverage. Tech Report CUCS-051-08, Department of Computer Science, Columbia University, December 2008. Leon Wu, Gail Kaiser, Jason Nieh, and Christian Murphy. Deux: Autonomic Testing System for Operating System Upgrades. Tech Report CUCS-037-08, Department of Computer Science, Columbia University, August 2008. © Leon Wu All rights reserved.